​Well yesterday was a BUSY day for Owl’s Nest Sanctuary for Wildlife, to say the least! Early in the morning we had a call for a Bald Eagle down on the road by the MyFWC…one of our key Rescue Volunteers Susan Miller responded to the scene and was quick to contain the Bald Eagle with the assistance of the Clearwater Police Department on scene. 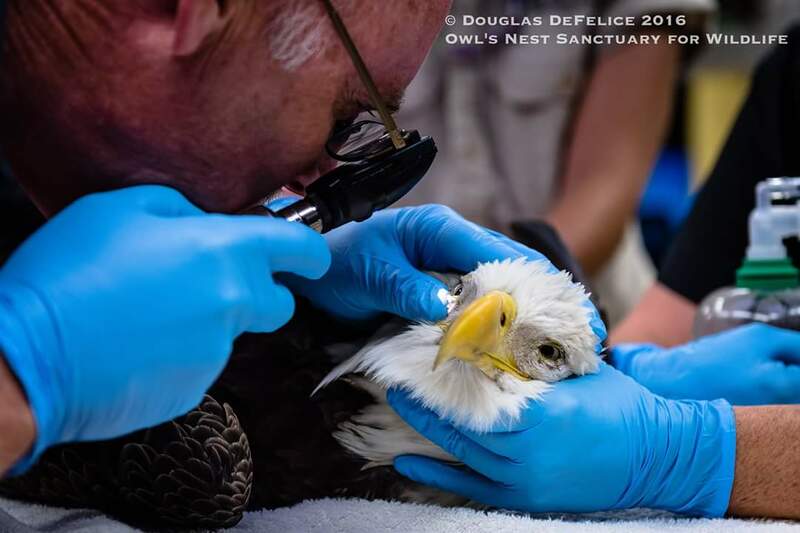 The Eagle was then transported to our Wildlife Partner, Busch Gardens Tampa Bay to be evaluated and treated by the magnificent Veterinary Staff (also known from the ABC TV Show The Wildlife Docs). After the evaluation, it was determined that the Eagle had a chipped bone to it’s Right Wing Ulna, at which time it was then taken directly to the Operating Room and Surgery was performed to remove the chip. The prognosis according to the Veterinarians is very good for this beautiful Bald Eagle, and we are hoping for a speedy recovery and a quick release back into the wild. Here are a few photos of the Eagle at the Evaluation/Surgery, more to come very soon!!! Stay Posted for Updates! Just wanted to check in on the female eagle. How’s she coming along? Well, I hope. Any idea of her release date yet? I see her mate, daily. Do you generally return them to the same area where they were recovered? I hope so. It would be nice to see the two reunited. Keep me posted. Thanks.